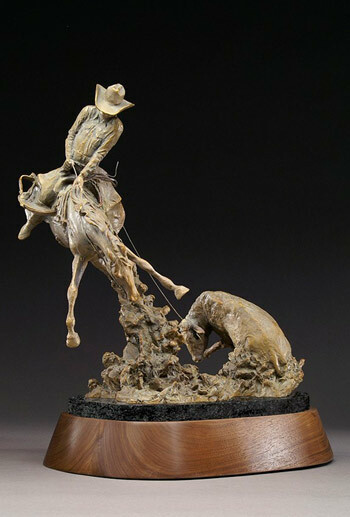 Greg Kelsey has spent most of his life immersed in art and cowboy life. His sculptures reflect, not just an affinity for western traditions and history, but a long involvement with both. For Greg, “the story of the western life is worth being told in an authentic way. When you live it, you can show a perspective that’s not always seen from afar.” Greg feels the storyteller should endeavor to communicate the mindset of his subjects; his life’s work is to create sculpture with a pulse and give voice to fleeting traditions. 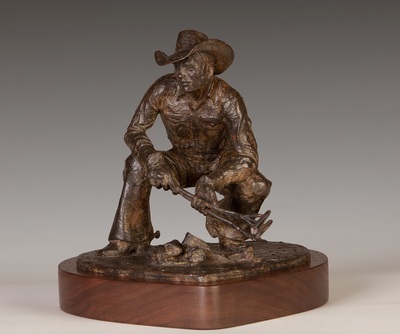 Being mostly self-taught, sculpture has been a continual journey of growth for Greg. He has found that “In every action there are simple, artful lines that occur naturally.” The magic is finding those lines and putting them to use to help him create the overall shape and movement of a piece – that’s “putting the art in it” as Greg says. The challenge is to bring the action across, in harmony with those lines, and let the piece live.